Discover the best of Florence’s Renaissance architecture and artistic masterpieces all in one day on this private tour that’s perfect for first-time visitors. Learn the history behind the sculptures, fountains, and palaces of the city’s grand squares, step inside gleaming churches, stroll through the medieval streets where Dante once lived, and admire the spectacular monuments of the Duomo Complex. Then, get an up-close look at some of the world's most iconic paintings and sculptures with included entrance to the Accademia Gallery and Uffizi Gallery. Florence is steeped in so much antiquity and it played such an important role in the Rennaisance movement, that it is crucial to have the right kind of guide who is aware of all aspects of the City and can bring it alive for you. Which is why we were very pleased that Sylvia was assigned to our family myself, my husband and our two young daughters by 'Made of Tuscany'. After a very interesting and meandering walk through much of the main sites of historic Florence, we vistited the Uffizi and Academia. The skip the line access into both museums that this Tour offers makes entering both places a much more pleasant experience. Throughout the day, Slyvia gave us much in depth insights into everything she showed us, most times pointing out unusual and unique things, which would have been missed by our untrained eyes. At the Uffizi she showed us all the main pieces of art and did the same at the Academia. During the Tour we were allowed enough time to stop and gape in wonder at all the beauty we were seeing, take photographs, purchase souveniors and even pick up gelatos. We even had a chance to visit one of Florence's iconic mosaic stores which has it's own workshop. Our questions were very patiently answered and my daughters were very well engaged. Sylvia knew that one of my daughters is a student of art and music and the other loves fashion, so she made it a point to highlight many features in the artworks and displays that we saw in the galleries and in the places and stores around the city, that were in line with their interests. It was also amazing to see how many people in Florence knew Sylvia-passersby, museum staff, store owners! We sure were in good hands. 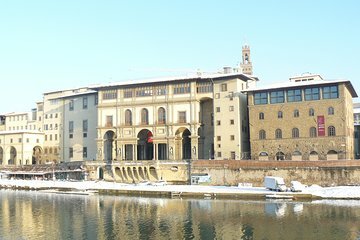 This Tour is something that you should consider because you get to see almost everything historic and essential that Florence has to offer in a single day. Moreover the explanations, especially of the exhibits at both the Uffizi and Academia, an Art Historian guide can give you, are incomparable.